Whether you're travelling by plane, train, or automobile, these Year two worksheetsHave everything you need to keep kids entertained for hours on end. From puzzles and word searches to bingo and "spot it" style games, these Travel game printablesHelp kids sharpen important logic, reasoning and reading skills while having fun. Vacation, here we come! Is your child a geography whiz? Put her knowledge to the test with this word search on U.S. cities. Like a visual treasure hunt, New York City Bingo is a fun alternative to I Spy. Your first grader will love searching for all the famous NYC sights. Travel bingo is a great way to pass the time. See who can get five in a row in any direction, horizontal, vertical or diagonal. Play a game of toss this St. Patrick's Day! This penny toss game is easy to start and lots of fun. This fun printable activity challenges kids to find a host of everyday and not-so-everyday items, from a milk carton to a Christmas tree. What do you get when you have a bike, boat, truck, and pay phone? Bingo! Play Road Trip Bingo with your crew the next time you're out of town. 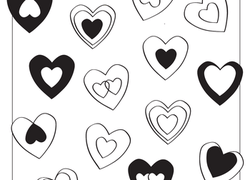 Help reunite these two friends by navigating this twisting, turning maze. Beat the backseat boredom with these Road Trip Bingo cards. With six variations on it, everyone in the car can play! Play Road Trip Bingo on your next driving adventure. 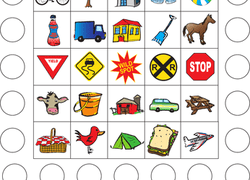 Full of traffic signs, animals, and vehicles, Road Trip Bingo will keep the whole family searching. The next time your family hits the open road, why not liven things up with a game of Road Trip Bingo? Kids will enjoy playing this game during the car ride. Road trips can be boring, sure, but they can also be a time for fun car games. Play Road Trip Bingo with the whole family on your next trip out of town. The backseat gets a little more fun with Road Trip Bingo cards. Your kids can play this fun road trip game the next time your family is going out of town. If your family is heading to Los Angeles this summer, keep a copy of this game in the car in case you get stuck in that famous traffic! Get into the holiday spirit with a Christmas puzzle that you and your little one can make at home! He'll add some festive colors to this picture.